Most homeschool moms think about purchasing curriculum for just the year they are teaching, but some of my best homeschool resources for teaching aren't curriculum. In my nearly 2 decades of homeschooling, I have been able to invest in some of the best resources that I could find that fit our beliefs, our homeschooling philosophy and enriched our lessons with these resources. As a Charlotte Mason educator, resources become more and more of our homeschool. Often times, these resources have been used alongside our curriculum, during sick days or teacher's day off (we need these sometimes, you know) or as a large part of our assignments. I love that these are non-consumable, so I'm able to use these with all of my children and year after year. The Bible – As Christians, this is one resource that I would never want to live without. We use our Bible for daily reading, discipleship, early history and for memory work. A Charlotte Mason Companion – This one book has been a pivotal book in our homeschooling journey. I have read it more times than I have children and may fit it in one more time before my youngest start his ‘kindergarten' year. I love how gentle she presents this way of education and feel blessed to have learned this early in our homeschool. All Through the Ages – Living books are the bulk of our curriculum and this resources has helped me identify great ones in the time period or geography themed that our homeschool curriculum was planning to go. A gold nugget to anyone trying to use living books for their homeschooling. The Wall Chart of World History – The older my children got in homeschooling the more this resource was used by them independently. They were able to use this resource to plan out their Binder Books with ease and they were always excited about things they found on the timeline. The 101 Series – Our children love these DVDs. I have no doubt that when the Physics DVDs come out, my graduated children will still want to watch them because they were so entertaining while teaching science in a creative way that held the attention of our whole family. We started with Biology 101 and then used Chemistry 101. I loved that the Biology was based on the literal days of creation. This made it easy to teach high school science with these DVDs while including my younger children and allowing me to learn aside them. Wes Olson is a great science teacher! The new DVD set of Physics is now available. Liberty Kids – This PBS series is one of the best ways to get your youngest children interested in the American Revolution. All of my children have watched this series and loved it. I was so thrilled to find it on Amazon , so we could add it to our homeschool with ease or take it on a trip with us in our vehicle. One of the best things for whetting the appetite of a child. American Heritage Series – I use this series for middle and high school grades. Our family LOVES it and watches it together, often times in the evening to ensure my husband can enjoy it with us. We always have a good discussion afterward. Moody Bible Institute – Anything that you can use that done by Moody Bible Institute would be worth having as a resource. We have used their 19 DVD series, as well as Wonders of Creation DVDs, which are part of the Amazon Prime Membership ! Poems for Memorization – I love this little book! I have assigned so many great poems for all of my children at all ages. One of the best resources of its kind. Nest Videos – Another series my children have grown up loving! The Old Testament, New Testament and Heroes Series is something that we loved so much we have started replacing for our youngest to enjoy with the DVDs. I love having these resources for me to pull out at any time or for my children to pull out on their own. 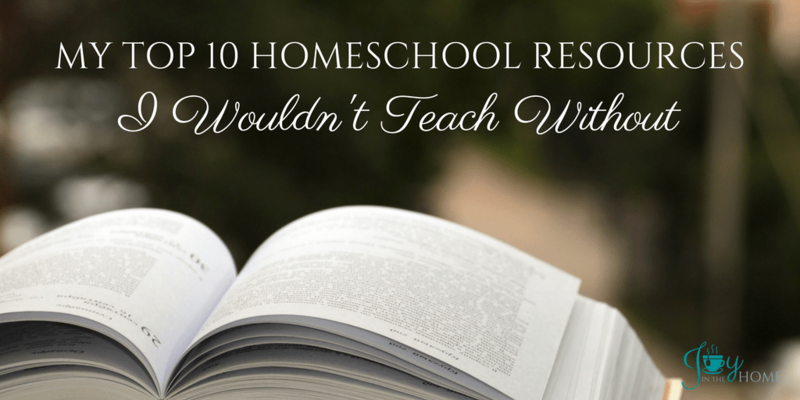 If you aren't considering good things for homeschool resources, you should! I want to thank The 101 Series, as sponsors of this post and hope you will visit their site to see what good things they have for your family!